Leslie Roache Accepts Position As UCCE Range Management Specialist! Extension. She formally joins the UC Davis Faculty September 1. “We had some serious competition to keep her here at UCD, and were lucky to do so,” says Dr. Kenneth Tate, Rangeland Watershed Lab. Her research is published on the Lab's site. Congratulations, Leslie! Many of you have had the chance to meet Leslie prior to her appointment as she has been leading the California Ranch Stewardship Program. She fills the void left by Mel George who we in UCCE called "Uncle Mel". Perhaps she will become known as Auntie Leslie. Please welcome her in her new career! Below is a repost from UC Davis College of Agriculture and Environmental Science newsletter. Most will recognized the name, Mel George, be it colleague, mentor, innovator or friend. I wanted to share this since so many of you are familiar with our UC Extension Range Specialist, now retired, as this is one of the highest honors the Society of Range Management bestows on one of its members. Well deserved Uncle Mel! Cooperative Extension specialist emeritus Melvin George received the W.R. Chapline Stewardship Award at the February meeting of the Society for Range Management (SRM), held in Florida. The award recognizes exceptional accomplishments and contributions in range management. George, of the Department of Plant Sciences, was commended for significantly improving extension education programs and science-based technical advice to ranchers, public agencies, and industry associations during his 37-year career. 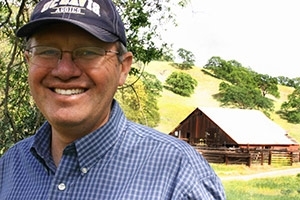 He was noted for establishing education and outreach programs that evaluated scientific information relevant to targeted problems, contributed new scientific knowledge to environmental issues, extended information to engage the ranching constituency in problem solving, and supplied the tools and knowledge to implement solutions to environmental problems. During his career, George developed and implemented a water quality research and education short course for rangeland owners that helped more than a thousand ranchers develop and implement water quality plans on privately owned rangeland. The process was adopted by state and federal agencies as a model for voluntary clean water programs. This approach improved grazing management, protected water quality, and led to enhanced stewardship on expansive public/private rangelands and watersheds in the western United States.